If you see a splash of brilliant red on a perennial plant in a commercial landscape or outside a nursery, it may just be Salvia splendens. This easy care species and its cultivars grow well both in the garden and in pots. 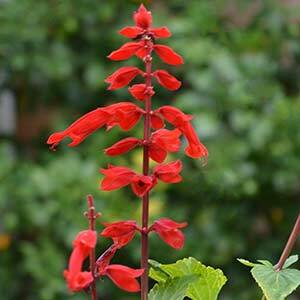 With brilliant red flowers Salvia splendens is commonly known as the ‘Scarlet Sage’. It is all one of the most popular of all of the salvias with many cultivars being available for sale. This is a plant from warm climates, and although this is a perennial in warmer climates, in cooler areas it is sometimes used as as annual and mass planted as a bedding plant. In our garden it is evergreen and long flowering. Many low growing varieties are available, and even different flower colours, however it is as the red sage that we think it is at its best. Excellent in the garden border, or in any cottage garden, Salvia splendens works well in mixed plantings or can be planted en mass for a strong effect. The lower growing varieties can be used as edging plants and are also suited to growing in containers. A number of dwarf varieties are available, we do prefer the taller type for most garden used, the smaller types can look good in pots, or if used as a low border plant. Growing well in part shade although coping with full sun, Salvia splendens does prefer a moist soil during summer. Fertilise in spring and again in summer. Plants can be pruned or ‘deadheaded’ to promote a second flush of flowers. Cut back by 1/3 in early spring if growing as a perennial. Common Names – Red Salvia, Scarlet Sage. Flower Color – Brilliant scarlet red. Flowering Time – Spring through Summer to Autumn, shorter flowering period in colder climates. Container growing – Salvia splendens is suited to growing in pots. Salvia splendens is available for sale online from the following growers.